There is increasing recognition in higher education that students who are more engaged in their course experiences learn more and succeed in greater numbers. While there remains an important place for didactic instruction through lecturing, more and more evidence supports having students participate actively during class time through team learning, problem solving, demonstrations, searching for and organizing information, and other forms of constructing their understanding. The delivery or acquisition of foundational information in such a model of teaching is moved outside of live class time, combining reading with a variety of online tools that both present and assess knowledge. Online tools also provide excellent support for continued collaboration by students and by providing visible repositories of shared student writing and reflection. Sometimes that online material can include video records of conventional lectures or condensed presentations of visual material with voice commentary added to it. Professors can model a variety of high end skills in a format that students can refer to at their own pace and on multiple occasions. It is not easy or trivial for professors to make the transition from a typical class format of mostly oral presentation to a more student-centered set of activities that build upon and elaborate what students learned ahead of time online. Many new skills are involved, including learning from the information provided about students by the online learning tools, constructing activities for class time that promote and develop learning, and building good alignment among online activities, in class learning, and written assignments. There are many resources at KU that faculty members have access to that can make that transition very straightforward, including seminars of like-minded faculty members who are developing their work at the same time and many examples of existing work at KU (and elsewhere) that model the practices faculty have found successful in helping students stay engaged in learning and succeed in developing the intellectual and professional skills we have identified. 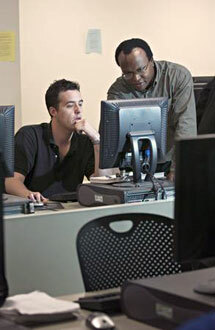 Your primary access to these resources is in the Center for Online and Distance Learning, an important resource located in 6 Budig Hall; CODL hosts many programs and has instructional designers ready to help sort out the steps needed to transform courses. The Center for Teaching Excellence is an active partner with CODL to guide faculty colleagues in thinking through how to take advantage of the opportunities to liberate class time for engaged and high level thinking and learning. By participating in our Best Practices Institute or attending our workshops and Teaching Summit, faculty members can plan the best strategies for redesigning their instruction to maximize engagement and learning, for students and for the faculty. To help you envision the kind of changes that can be done more incrementally, we also have some faculty colleagues who are working on pieces of a course sequentially over several offerings. In Spring 2012, several faculty members convened at the Center for Teaching Excellence for another course redesign seminar. These seminar participants focused on developing new approaches to teaching introductory courses that in the past had relied heavily on lecture. These instructors are moving content delivery gradually to text and online sources, while enhancing the engaged nature of their face-to-face time with students in class. If your reading of their descriptions sounds interesting and you would like to know more about how to proceed in this direction with your teaching, please contact CTE for more information on how to get started. Following are summaries of the teaching projects these faculty members have undertaken, based on their experiences with colleagues in the CTE seminar. The course we are targeting is General Physics I, an introductory freshman/sophomore course taken by about 250 KU students each semester. Presently class time is used to lecture over material in a way that highlights what students should have read in the textbook, and to present short example problems. We are preparing to change the course into a hybrid one, where we'll move most of the lecture material online and use class time for interactive problem solving. Under the old format, the course did not address complex problem solving very effectively or force students to go beyond a formulaic approach to problems. Since we want to prepare students for complex problems, the course redesign is focused on addressing these skills, while not sacrificing other course goals. At least half the class time will be spent with students actively learning in groups. Group writing exercises on concepts and problem-solving strategies will be used, as well as group problem solving of complex problems. These "context rich" problems will help students learn to extract relevant information from a situation. These strategies should also be used to help students see the everyday applications of the concepts and relate better to the material. In Spring 2013, we’ll test the redesigned course in the honors section of PHSX 211. Taking what we learn this term, we’ll offer PHSX 211 in the new hybrid format in Fall 2013. I have implemented many new practices in my ECON 142 and 143 courses. Outside of class, students now answer 30 homework questions at the beginning of each week, questions about the material we will cover in classes the coming week. I’ve also posted videos using Educreations software, posted slides from class, and posted links to several interesting TED talks related to topic discussed in class. In class, students work on group projects every other Wednesday. Students work in groups of no more than four, and each group member is from the sam discussion section if possible. All group work is archived in PDF files. Every class, I use Poll Everywhere to get feedback from and information about my students. Polling also gives the class more practice on concepts we notice are causing problems, and it guides the class by allowing students to select concepts that I need to talk about more in class. Because of the amount of active work the students do in class, class time is more interactive and students are more engaged. I’m also able to have deeper conversations about course topics in class. Restructure the sequence of lectures: Rather than switching back and forth between plant and animal topics throughout the course, lecture will be reorganized into four broad topics: evolution/phylogeny, organismal diversity, structure/physiology, and ecology. Establish working group of 3–4 students: Students already work in small groups in lab, but previously we've done little to no group work in lecture. I plan to use small groups for both in-class and out-of-class learning activities. Pre-lecture preparation: Students will be provided with an outline for each lecture and will be asked to review portions of the text, define terms, label figures, etc., prior to lecture. In addition, there will be weekly Blackboard quizzes that the students will be required to complete prior to lecture. Active learning activities: I hope to have at least one active, in-class learning activity to introduce each of the four broad topics. Each activity will require students to done some prep work in small groups outside of class. I’ll select two or three student groups for each activity and record them doing science with the assistance of CODL. These video clips will be brought into the classroom and used to prompt think-pair-share activities. Enhanced scientific literacy: For one course requirement, I plan to have students read a scientific paper primer that helps students learn to identify key ideas in an article and how to interpret graphs and figures. Meet the biologist: I’ll work with CODL and colleagues from EEB and Geology to create six to eight short (five to ten) minute video clips and/or white board lectures on topics spanning the course content. Weekly wrap-up: Each Friday, the instructors will put a video/white board summary of the concepts covered in that week’s lectures on Blackboard. Elementary Linear Algebra covers systems of linear equations, matrices, vector spaces, linear transformations, and applications. My goals for the course include illustrating and helping students explore many of the topics in linear algebra using interactive computational tools, in particular, matlab. Many of the standard tasks related to linear algebra sch as solving linear systems and finding eigenvalues and eigenvectors are tractable using pencil and paper calculations only for low dimensional problems. Giving students access to and knowledge about quantitative computational tools allows them to bring their skills to bear on medium and high dimensional problems that are found in many applications. To meet these goals, I’ve redesigned the course so that reading and prep work replaces lecture. Class time will be used for problem solving. In addition, I’m using problem based learning to create a search engine using the math in the course. Psychology as a science: We'll indirectly review material on the scientific method and supplement this knowledge with several skills, including finding, comparing, ,and critically evaluating information. The brain and nervous system: We'll explore these biological components in the context of perception and action, memory, and language, thereby pre-viewing upcoming topics in the class. I plan to use short video clips to prompt discussion and indirectly review material from the online tutorial. Learning: In class we’ll have a mini-lab session using Sniffy the Virtual Rat software. Students will obtain hands-on experience using the principles of classical and operant conditioning to elicit a certain behavior from an organism (albeit a virtual one).